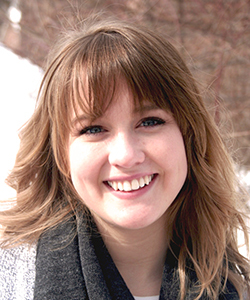 Stephanie Kuhn ’15 of Kittery, Maine is the recipient of the Stanley A. Hamel Traveling Fellowship for 2015. The fellowship was established in 2013 and funded by a generous endowment from Stanley A. Hamel through the New Hampshire Charitable Foundation. Administered through the UNH Office of National Fellowships, the Stanley A. Hamel Traveling Fellowship provides around $3,800 for self-designed travel in Europe to observe and absorb the culture that influenced the history of the United States. UNH graduating seniors and recent (up to five years) graduates are eligible to apply. Stephanie Kuhn will graduate from UNH in May with a double major in Women’s Studies and Communication, and a minor in Race & Ethnic Studies. She will travel to the United Kingdom for 6 weeks to investigate women’s political participation in British Parliament and draw connections between UK and American women’s political activities. Kuhn designed an itinerary of museums, archives, and monuments across England, Wales, and Scotland. She will also visit current social service and women’s organizations in the UK, complementing her work stateside with the New Hampshire Women’s Foundation, UNH President’s Commission on the Status of Women, and Office of Multicultural Student Affairs. Kuhn hopes to apply this international experience to her future career goals of increasing women’s voices and leadership diversity in politics.